Be the first to share your favorite memory, photo or story of Betsy. This memorial page is dedicated for family, friends and future generations to celebrate the life of their loved one. 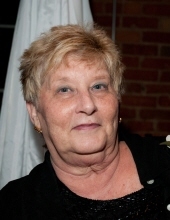 DURHAM: Betsy Taylor, 71, passed away on Thursday, March 21, 2019 at Duke University Hospital in Durham. She was born in Durham to the late Leonard William Cheatham, Jr. and Ellen Berry Cheatham. Betsy was a loving grandmother, wife, and loyal friend. She was retired as a Medical Records Assistant at North Carolina Eye, Ear, Nose and Throat after 20+ years of dedicated service. Her witty and charismatic personality will be forever missed. Betsy is survived by her husband of 33 years, Richard Taylor; sons, David Morgan and wife Cory, Dan Morgan and wife Ashley; sister, Nancy McIntosh and husband Jim; brother, Bill Cheatham and wife Brenda; grandchildren, Taylor Morgan, Macie Morgan, Madison Morgan, and Cameron Lewis; and several nieces and nephews. A graveside service will be held at 2:00 p.m. on Tuesday, March 26th at Maplewood Cemetery with Rev. Larry Bowden officiating. To send flowers or a remembrance gift to the family of Betsy Taylor, please visit our Tribute Store. "Email Address" would like to share the life celebration of Betsy Taylor. Click on the "link" to go to share a favorite memory or leave a condolence message for the family.